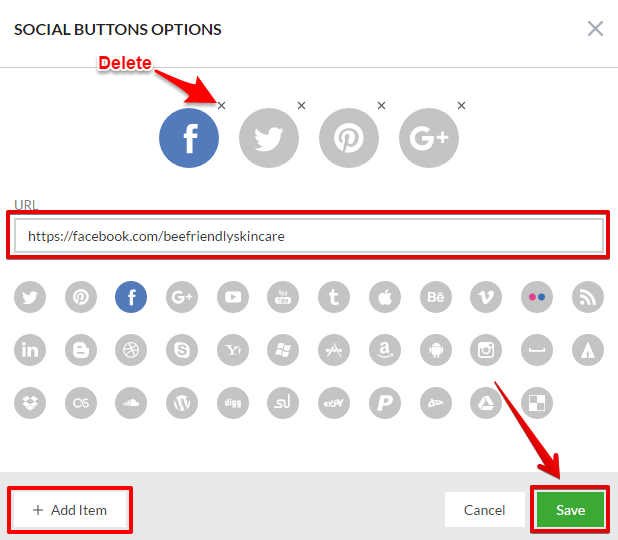 The Social Buttons element allows you to add Social Buttons linked to your social media account pages. Just add any block which contain this element to your page and start editing. Click on the "+ Add Item" button and then choose your desired social network from the predefined list and enter the appropriate URL. You can remove each icon individually using the delete icon in the upper-right corner of the icon area. Note: If you add more than 13 social buttons, it will create a second row on your published page. Add more than 26 and it will create a third row and so on.